Great for Bridal Showers, Birthday Parties, Team Parties, Scout Gatherings/Fundraisers, Housewarming Parties, Friends Night Out, Anniversary Parties, or JUST FOR FUN! 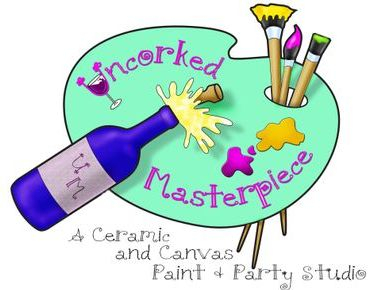 Let us help you Uncork the Masterpiece that is bottled up inside! You bring your favorite beverage and snack and we provide the fun. Located in beautiful Reynolda Village. Check our calendar for events and the "Painting of the Night." We are open at 5:30 so that you can come in find a seat and get set up. Call to reserve your seat. Celebrate your birthday with us and the birthday girl or boy receives a handpainted ceramic birthday plate decorated by one of our artists or by those attending the party.